For some reason, I have avoided this movie all this time. I've been told to watch it by several of my friends in the past, but I just never got the urge to. Maybe because I subconsciously thought it was geeky or that space combat genre just never interested me, but either way, it was more conventional and mainstream than expected and thus difficult not to enjoy to some extent. 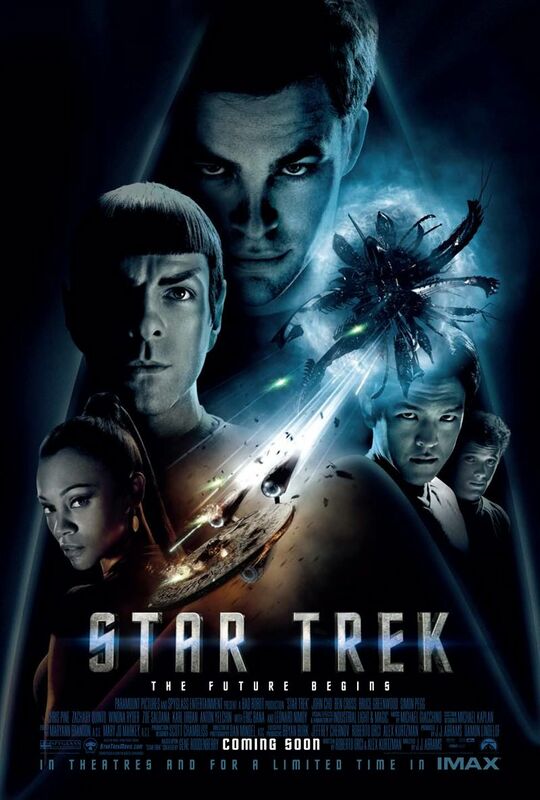 Kirk (Chris Pine) enrolls into Starfleet in order to live up to his father's legacy as a hero who sacrificed himself to rescue hundreds of people, but is met by Spock (Zachary Quinto), a half human half Vulcan, who fights Kirk's brashness with logic. When a time-travelling Romulan threatens the Federation by destroying planets with black holes, the two must see past their differences in order to save the universe. The opening sequence to the movie was spectacular and I thought that was the most captivating few minutes of the whole movie. From then on, the plot was very streamlined, linear and a little too conventional Hollywood in terms of flow, making it rather predictable. The only saving grace was the time travel element which added a level of complexity and thought, but not enough. Character building was very shallow for almost all of the characters apart from Spock. His half Vulcan half human element makes him the most interesting character to watch and definitely steals the whole movie. I found his dynamics with others and just the way he is extremely diverse. The film was nominated for four Oscars (effects and sound categories) and won one for make-up. However, some of the effects were rather uninspiring for such a futuristic/sci fi movie. Perhaps it is making reference to the imagery from the previous iconic Star Trek movies but I don't know- I thought there would be more WOW moments. The Romulan ship was perhaps the one thing that did make me go WOW. There are also some very unbelievable moments, especially with the combat. Kirk is dropped from about 2 metres and manages to cling on to a ledge which has a shiny smooth surface. Other annoyances include overly convenient escapes which just seem TOO convenient! As we reached the climax, it was all too predictable and you could see just how it would end, and it does end the way it ends with no surprises. Perhaps there are lots more themes and imagery that Star Trek fans would have picked up on and therefore loved about this movie, but for me, a complete Star Trek n00b, viewing this from a normal movie-goer point of view, was not amazingly satisfying. Also stars Chris Hemsworth and an unrecognisable Winona Ryder. Chris Pine annoys me. He always has. I have yet to find a movie where he isn't annoying. For me, he is like the male version of Keira Knightley where he either has no expression, or overacts and when he cannot find a suitable expression, naturally returns to a smug face- perhaps his smug looks got him this role. who knows. but he did NOTHING for me. Even Zoe Saldana who has comparatively little screen time manages to convey a range of emotions which are believable and genuine. Zachary Quinto was sublime as Spock and definitely stole the show- whilst his character is by default emotionless, he is able to break through when necessary. Having not seen any Star Trek before this, I thought the movie was bearable and enjoyable mostly, but there are many basic movie things that annoy me such as lack of character development, unbelievable and convenient escapes etc. Perhaps it is because I don't like Chris Pine which dampened the movie for me, but I thought it could've been slightly more complex. That said, the trailer to the sequel 'Star Trek Into Darkness' does look a whole lot better, and that will be out on the 17th May so I'm be sure to catch it at some point (hopefully not 4 years later like I did with this).